The day we crossed into the Atlantic from the Hebridean Sea we could see it, a tall stick in a distance. It was the Monach Isles, we were debating for a bit whether to go there or follow the coast further, in the end we left it to the morning to decide. Woken by the sun we looked over to the isles, they were nicely visible, wrinkles of green and white with a light house on one of them. Decision has been made for us, of course we will paddle there as we can see it so clearly. It took about two and half hours in pleasant conditions, surfing lightly forward. Monach isles consist of five islands and some of them were inhabited in the past. 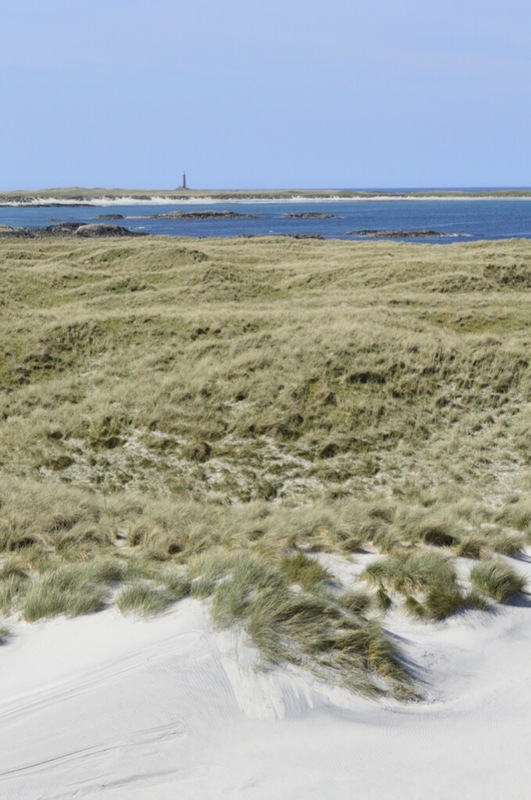 The green and white we have seen were the dunes, apparently the highest in Britain. We came closer and it was time to decide on our landing spot. However rather than long sandy stretches, all we could see were boulders lining the beach. We started to look for a gap in the rocks, and then heard it. The sound, oh no, they weren’t rocks. 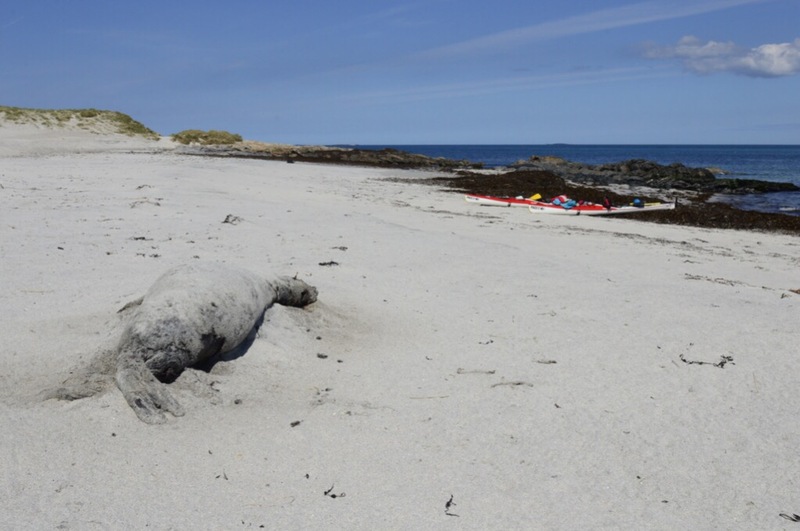 Of course we have read that the Monach Isles have one of the biggest seal colony in North Atlantic but who thought it would be lying on the beach. We made a retreat and went to look for a landing place without the danger of disturbing them all. Found it just round the corner and named it Dead Seal Beach. No wonder his former friends no longer wanted to share this space. We could not choose a better day for the visit here. 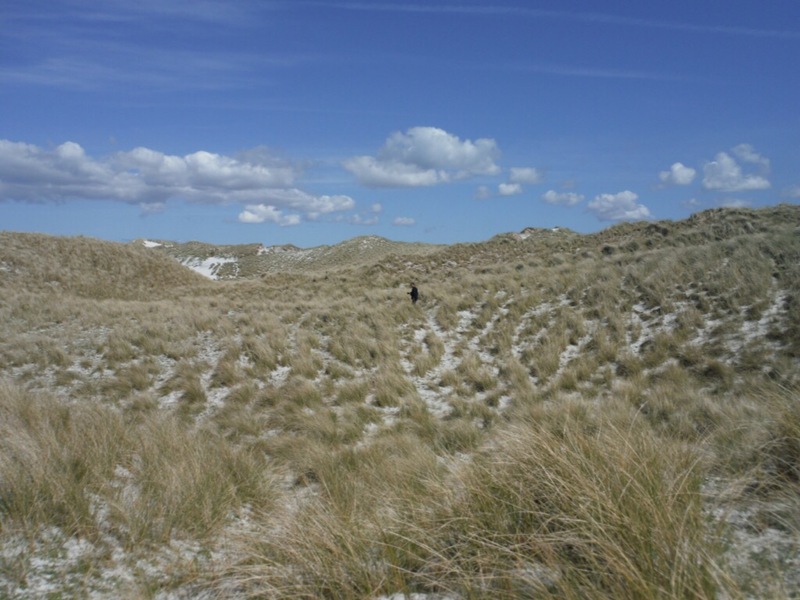 It was warm and the dunes sheltered us from the wind. It was also very quiet apart from the sounds of bees, birds and seals in the distance. The stillness was there and now disturbed by running rabbits. We walked all the way to where the village used to be. People lived here until 1942, and then one more family moved in for few years at the end of the 40’s. People lived mainly on two islands, this one and the one with lighthouse. Interestingly this lighthouse was manned still in the 1937. So many people lived here, that a school was built here. It looked very idyllic in the warm sun, that it was hard to believe that these isles have about 160 days of gales per year. 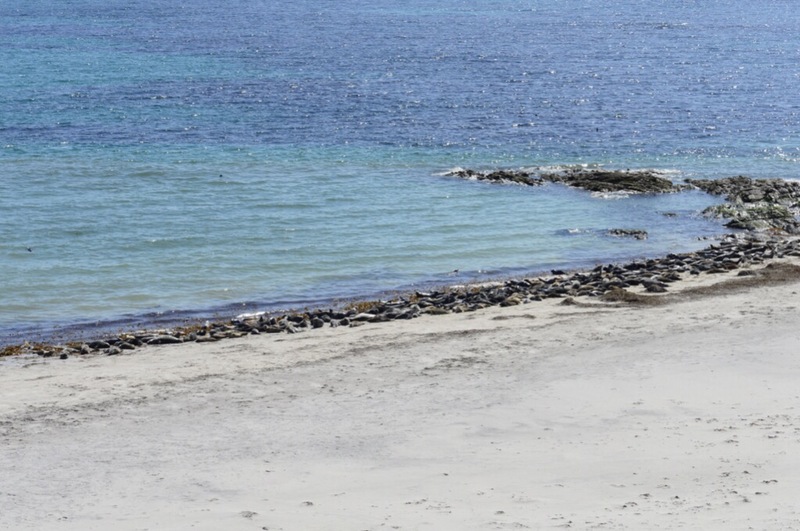 Although it is a place out in the Atlantic, it has been visited regularly by fishermen, mainly from the isle of Grimsay. Nowadays there’s the old hall with exhibition and the old school house. This was repaired and sometimes people stay in there. We debated whether we should stay and live out the bad weather here, we found the keys and looked into the room which serves as shelter and respite to fishermen and boatsmen. Unfortunately we wouldn’t be able to comply with the note saying “Leave it as you found it” as we would have to tidy it first, so we decided to leave for North Uist instead. This entry was posted in NORTHERN FOUR by NAtalie. Bookmark the permalink.